some chronos seem incredible! I met this particular gap in Project CARS or guys turned more than 2 seconds deviation! I wanted to know why. this is what it practiced on RFactor 1, personally I did 2 or 3 races this simulation, my times were really means in relation to others, I quickly recommended to use the hood view, instead our traditional interior view! miracle and there! least one second lap! certains chronos paraissent incroyables !!! j'ai rencontré cet écart notamment dans Project C.A.R.S ou des gars tournaient a plus de 2 secondes d'ecarts !! !j'ai voulu en savoir pourquoi. c'est ce qui ce pratiquais sur RFactor 1, perso j'ai fait 2 ou 3 courses sur ce simu , mes temps étaient vraiment moyens par rapport aux autres ,ont m'a vite recommandé d'utiliser la vue capot ,a la place de notre traditionnelle vue intérieure ! !et là miracle ! !une seconde de moins au tour !! M Waechter wrote: Could someone explain how to be able to drive low 1:50s at Imola in the McLaren ? It understeers as hell -rolling over the front axis-, you can't even hold the line on the straight's fast 4th & 5th gear corners, so that you can't bring the car into the right position until the next corner appears. When you try to steer more to overcome it, then of course at one hit of the side asphalt of the track, it spins out. Just wondering how the aliens drive this car and being mabye 6-7 sec. faster. I guess you are overdriving the car. Probably you try carry too much speed into corners and also you might turn too much. McLaren, like other road cars needs very smooth inputs. After you learn to handle it smoothly you can try again to push more. btw. how is your McLaren lap times vs 458? Yes, I know that . Overdriving, -beginning on the top of the limit / beginning over the limit, when trying a new car, and then work downwards kind of step by step to the point some grip begins to appear-, is the way I do most times . I may try another track also, seems like Imola is not my best track in AC in the moment (tough it was in NKPro with Formula cars at least). Will try the car at an another track, Mugello, and see if the gap to top times will be less. Regarding Ferrari 458: I still did not drive it yet, just for a few seconds. Will do later. Edit, btw. @Laurent: How much rear wing did you use for your lap in Imola with the Pagani ? Not easy to drive with less wing (lesser then 10 or 12), because then it gets too oversteery with the front 'wing' or kind of 'flap' not adjustable as much as in other racing cars. Four new cars, two more tracks, tons of achievements, drag racing and more. Imagine with NetKar we had ~9 cars and only used 5-6 we were busy at for a long time. Now we have almost tons more of amount. I don't come along (have enough time) to test all of them in a serious way (and not to mention about all the tons of possible achievements you can unlock for fun if you want), would be a full time job to do so. As they claim on FB by themself about the forth update "Sry to steal your holidays (time wise)." . At least I find it a little easier / less time intense to find a right car setup. The option to turn off tire wear also makes it easier to keep the car in a same condition (except tire temperature), when you just want to test out setup values for a certain car. So that you can compare setup settings more direct now. Also each tweaking in toe and camber as well as tire pressure,.. can be felt quite well on track/corners in AC and also in a logical way (it covers with my experience). And non racing cars have less settings and range of values to try out = no setup testing over days like in NKPro (for me) . -Though some cars as Formula Abarth and some other racing cars have enough (similar amount as in NKPro) setup adjustments of course, there you have to spend some more time with. In drag racing the 'traffic' light is always at green as soon as you get on track or Restart the session & so time is always counting immediately.. . So to be competitive / have competitive drag racing times, you have to start the driving quite immediately / directly after pressing "Restart" , because at wating, the waiting-time when standing still already counts, though the car has not been moved so far. on Gian, me who believed etre in retirement!!! veils that I delay me has work!!!! Stupid question: Can anyone explain, how the drag-racing is to use ? Because when I start a session or restart one, .. the lights are always green straight from the beginning and I have no AI car either. I can't find a "start race" button or a similar thing during the session, if there is one (I read about such button, but can't find it ). Edit: Now I recently noticed that everything works fine in "Race" Mode, but in "Hotlap" Mode it is as described above. In "Race" Mode I can then choose an opponent and the lights go from red (or yellow) to green = start of drag race.. . But in that "Race" Mode the app will not work of course, it works only in "Hotlap" Mode as you all know. So what might be to do to get the lights working correctly also in "Hotlap" Mode ? btw. Did you notice the "wrong way" message has gone since v0.4 for some reason (or not reason ). So when you drive a track the wrong way no meassage will appear anymore. Not a big issue, as we normally drive in the right way , but as I always notice much any difference in detail, this difference popped in my eyes as well. Anybody else who don't like the Pagani Huayra ? For me it's a perfect example for a high tech car with tons of toys, but with a under-carraige / body like shite (any Golf III has had a better one). In real life it just fits to the needs of ' noble guys, who want comfort. Understeers like crap ;)and has no feel for grip because of its suspension characteristic. Basically it's a matter of taste, I just don't like those cars with a too 'soft' ('wide') suspension like the GT3 BMW is such one compared to the GT2 BMW as well. A little bit of a soft suspension dynamic is ok / good, but not that mentioned kind of. I SHARE YOUR NOTICE NOTICE MARCO, this car is a "truck", heavy, inaccurate! Not a race car! If this thing understeers so bad and is so crappy, why is it a couple seconds a lap faster than a 458 using the same (or very close to it) semi-slick tires? This thing is a beast that eats Ferrari's, Lambo's, and damn near every other car on the planet yet can be driven to the store by your wife.....and it does it all with a full luxury interior and no big ugly wing. Maybe you're right and the corner speed really isn't that low like it feels in the first moments. But mainly it is only a beast because of the engine, not because it feels so nice . Like Laurent I find the engine + charakter of the car just a bit inaccurate (describes it best) to drive (an inaccurate mixed cocktail). But I haven't tried it too seriously so far, so maybe I'll change my opinion a bit ! M Waechter wrote: Maybe you're right and the corner speed really isn't that low like it feels in the first moments. But mainly it is only a beast because of the engine, not because it feels so nice . I hated it at first as well, but it feels a bit like a huge overpowered american classic after i drove it a bit :DLove oversteering from the apex hehe! Did you notice that the M66 track has got new (more vintage and realistic looking) textures (asphalt texture has changed a lot, commercial banners look more dirty) and other changes since v0.8 or v0.8.2 ? Edit: Ehm no.., something must have fooled me -lol- at that particular night, after driving on Nürburgring for some days and then switching back to M66 again.. (the reason for it). I think the textures are still pretty much or all the same, only lightning is a little different. -Unfortunately the lightning of the trackside objects (buildings commercial banners) looks not perfect now at the moment, many of them are too dark. Previously it looked more fresh and -depending on the angle they appeared on track- were lightened individially by the sun and in general were not so unrealistically dark. Maybe a different track daytime gives another picture, not sure. I definately like the new sky in AC since v0.8, has a better natural color and cloudshape,.. . The old sky(-movement when turning around) was kind of like looking/driving into/in a "tunnel" or under a cap after some month of facing it and kind of 'depressing' because of that effect in a certain way . 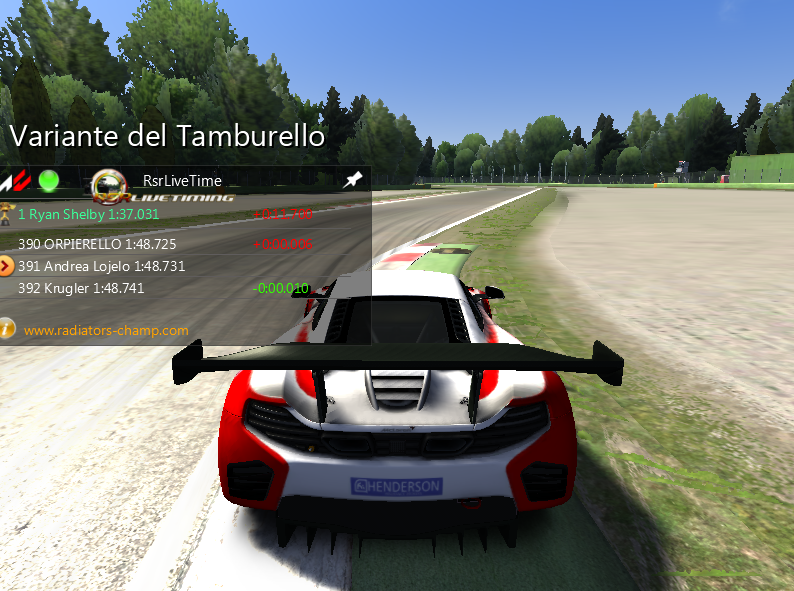 problem invalid lap tamburello with RSRlive timing, IMOLA! 2 wheels on the track at all times when it is not 4, every time! Hop! lap invalid ! whereas with Rivali tempo, no problem, turn validated with the machine simulation of the penalty, no problem and no penalty! with the leader board friend, ditto valid tour! it's normal. We don't have the same way of calculating penalties as Rivali. We both use automatic ways of handling lap validation. Both have good points and bad points. Both handle things perfectly in the most of the cases but not so well some particular cases. Our rule is based on out of the track boundaries+ dirt on your tires. With AC there is no 2 wheels on track or FIA rules applied. We had to come up with our own validation system. The good thing is that is the same for everyone that is using our app, therefore everyone has the same problems/constraints. If you want to do a lap with our app, you need to go tighter there. Everything depends on how AC track maker decided to have that particular corner. Dirt+out of track there, force you to have a tighter line with out rule. That seems to be very weird. I can't reproduce the issue, Laurent. I'm still green even cutting much much more. Do you have the same issue even at low speed? If you do it at speed, does it happen all the times? Can you do similar screenshots/video showing the app going red? Right click the game in Steam > Properties> Local Files Tab > Verify Integrity of Game Cache. first of all, Andrea, thank you for the attention you wear to my post. the signal turns red with the message "Invalid round" exactly at the entrance of the first left turn Variant Tamburello, when, as the two videos above, my wheels go up slightly (particularly in the first video) on the patie Kerbs of red and white, and always at high speed (4 th gear is reacceleration), when I enter the right turn on red indicator RSR is already live timing and speed allumé.a small amount more on this part of Kerbs incredible, the light stays green! I checked as you advised me, the entire cache simulation, and tomorrow, Go, I try again! tonight I follow out!